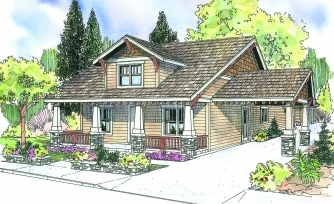 Stone veneer bases support the tapered columns fronting this Craftsman-style bungalow home plan. Inside, the living room links to the dining room, which is open to a sunny nook and kitchen. A cozy window seat nestles into an alcove in the nook. Owners’ suite amenities include a walk-in closet and spa tub. 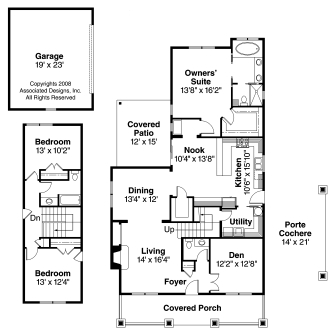 Total Living Area: 2222 square feet. 1st Floor: 1700 square feet. 2nd Floor: 522 square feet. The Markham - Plan #30-575 - Associated Designs, Inc.
To estimate the cost, I’ll use the Craftsman cost estimating software, inputting Class 5 Average Standard Quality, concrete slab foundation, and a zero-clearance insulated prefab metal fireplace with brick facing. I treated the Porte Cochere as a carport when estimating the cost to build the house. There is also a detached garage. Using this foundation shape on the estimating software for the Boulder, CO area, I came up with $242,159 including a general contractor markup of $27,646. The cost estimates used by this cost to build calculator are from the National Building Cost Manual, published by Craftsman Book Company.